GURPS Places of Mystery is designed for use with a very wide range of games. 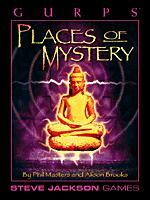 This is a book of places and locations, chosen because they all have at least a hint of the unusual about them. Some are widely believed to be centres of great magic; others "merely" have an interesting history, or unique features. Others again are simply amazing tourist spots, for one reason or another. 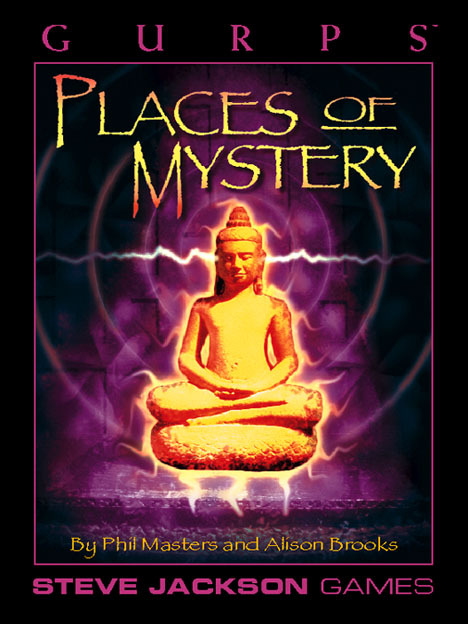 The sites chosen for this book are nearly all buildings, cities, or other human constructions. We've slipped in a few natural places of mystery, such as Ayer's Rock (which is just as much a sacred site as the Church of the Holy Sepulchre) and Loch Ness (which we just couldn't leave out), but they are exceptions to prove our rule. The rule was instituted mostly because of the space we had available, and the need for a consistent "style." No doubt, someone could also write GURPS Geography and Geology, and in fact it would have almost as much gaming potential. (And we'd quite like to see it.) But this supplement is about the creations of humanity – in humanity's slightly stranger moments. Incidentally, some of the buildings mentioned in this book are intact today, but time, nature, and the human tendency to fight wars being what they are, many are in ruins, or actually lost. (One or two probably never existed in the first place.) Still, ruins have lots of atmosphere; remember the conclusion of Shelley's poem. GURPS Atlantis – Long ago, beyond the edge of the world, a great empire grew decadent . . . and sank forever beneath the waves. The Lost Land; the Sunken City; the Ancient Birthplace of Secrets. Additional Ley Spells – Here are a few outtakes from Places of Mystery that Phil thought might be of interest. "The authors would like to thank David Edelstein, Mrs J.I. Flin, Steve Gilham, Liam Gormley, Jenny Hein, David Pulver, the Rev. Michael "Moriah" Sullivan, and Jo and Ken Walton, for playtesting, extra information, and useful comments on the contents of this book. Special thanks to David Flin and Angela Masters, who helped chase down quite a few of the mysteries – amongst other things."